Sun City Summerlin is Del Webb's first active adult community in Las Vegas, Nevada. It is nestled within the Spring Mountain Range at an elevation of 3,000 feet. With 7,779 homes, Sun City Summerlin is the largest active adult community in Nevada. It boasts four clubhouses, three golf courses, and three restaurants among many other world-class amenities. This 55+ community sprawls across 2,400 majestically rolling acres that boast magnificent views of the surrounding mountains and the Las Vegas Strip. This ideal elevated location offers cooler temperatures and cleaner air than communities in the lower elevations of the Las Vegas Valley. Construction began in 1989 by Del Webb and was completed ten years later. Del Webb's Sun City Summerlin is part of the Summerlin master-planned community on the western edge of Las Vegas. Summerlin is comprised of nearly 20 separate residential villages spread across 22,500 acres. It is woven together by more than 150 miles of trails and 100 neighborhood parks. This well-established neighborhood boasts tree-lined streets, great shopping, top-notch restaurants and award winning resorts, casinos and spas. The community has been incredibly popular with active adults for its bountiful amenities and reasonably priced homes and villas. With over 80 clubs and interest groups and other exciting activities, the community caters to retirees who want to get the most out of life. Sun City Summerlin boasts more amenities than any other active adult community in Las Vegas. The heart and soul of this development are the community's four clubhouses that house a vast array of world-class amenities. With so many options, there is never a shortage of opportunities to enjoy everything the community has to offer. The Mountain Shadows Clubhouse includes an indoor spa, exercise room, and a table tennis area. The Mountain Shadows clubhouse is also where residents enjoy the terrific year-round Nevada climate, boasting six tennis courts, four shuffleboard courts, a racquetball court, an outdoor track, and more. Whether you want to brush up on your putting skills in the mini golf course or catch up with neighbors in the picnic area, the Mountain Shadows clubhouse has you covered. The Desert Vista Community Center is a 44,000 square-foot facility that hosts a grand ballroom with a dance floor and stage, as well as an fitness center and an aerobics studio. The activities continue outside with an outdoor pool and spa ideal for relaxing, four bocce ball courts for some friendly competition, two pickleball courts, and four lighted tennis courts. Swimmers will love discovering the Sun Shadows Clubhouse, boasting the community's magnificent Olympic-size indoor pool and spa. The clubhouse also acts as a meeting place for neighbors with several meeting and multi-purpose rooms and card rooms, as well as an aerobics studio for staying in-shape. Outdoors, the Sun Shadows Clubhouse is home to four bocce ball courts. The Pinnacle Clubhouse is the cultural center, housing the 312-seat Starbright Theatre, which plays host to many popular theatrical and musical performances as well as movies and guest speakers. This clubhouse also features a multi-purpose room, an exercise room, and a music room for the hobby musician. Residents also enjoy the clubhouse's outdoor pool and spa, four tennis courts, and the softball field for a game with neighbors. Golf enthusiasts are greeted with three outstanding courses at Sun City Summerlin in Las Vegas, NV. Each course was designed by the award winning team of Hall-of-Famer Billy Casper and renowned golf course architect Greg Nash. The resident-owned courses offer yearly membership options and reduced fees for residents. There are two championship 18-hole courses and one executive 18-hole course. Palm Valley was the first course built in Sun City Summerlin and is located next to the Mountain Shadows Clubhouse. At 6,580 yards and a rating/slope of 72/127, it's the community's most challenging course. The Eagle Crest Executive Course, conveniently located adjacent to the Pinnacle Clubhouse, is a manageable 4,067-yard, par-60 course that offers magnificent panoramic views of the Las Vegas Valley. Highland Falls is a par-72, 6,512-yard course situated at an elevation of over 3,000 feet. The course features a sporty layout and dramatic elevation changes. Each golf club offers great dining options. The Five Star Tavern in the Palm Valley course is the place to grab a quick snack at the turn or some drinks and dinner after a round. The Summit at Eagle Crest offers unsurpassed views and is ideal for banquets and large gatherings. The Tavern at the Falls at the Highland Falls course enjoys spectacular views of a cascading waterfall. There is a wide variety of models to choose from in this active adult community. There are 42 different models that include 18 attached models and 24 single-family home models. The attached homes offer between 1,003 to 1,757 square feet of living space. These models include one to two bedrooms and one to two-and-a-half bathrooms. One-and-a-half to two-and-a-half car garages are available, which are perfect for extra storage or space to park your golf cart. The attached homes are all maintenance-free with most exterior home maintenance covered by the association. Single-family home buyers have a wide variety of options with floor plans that range from a modest 1,086 to a more luxurious 2,895 square feet of livable space. These models include one to three bedrooms, two or two-and-a-half bathrooms and an attached two to two-and-a-half-car garage. Gorgeous views of the golf course or homesites overlooking the Las Vegas Strip are customary on many of the homes in this community. Many residents remark that the lifestyle here is like living in a world-class resort, and with over 80 different clubs and interest groups there is something here for everyone. Residents who are interested in arts and crafts might enjoy the beading and jewelry club, ceramics, sewing or stained glass clubs. Sports and fitness-minded residents can join any number of clubs such as golf, tennis, softball, pickle ball, and hiking. Other popular groups include bridge, book discussion, canasta, bocce ball, community theater, and numerous dance clubs to name a few. The community activities director custom tailors a fun-filled calendar designed around the requests of residents. There are many fitness classes such as yoga, aerobics, pilates and aquacize. For residents who want to continue their education, there are classes in everything from foreign languages to cooking in close proximity to the University of Las Vegas. Each month, a newsletter highlights the many activities and events offered in the community. Residents can partake in day excursions to the Las Vegas Strip and even exotic trips such as cruises and trips to Mexico. Whatever your interests include, Sun City Summerlin will offer you the opportunity to live life to the fullest. The area surrounding Sun City Summerlin in Las Vegas, NV has experienced tremendous growth. There are many retail stores, banks, libraries, grocery stores and two new hospitals in the nearby vicinity. A public bus goes through Sun City Summerlin and provides rides to seniors at a reduced rate. For further travel, Sun City Summerlin sits just twenty miles from the McCarran International Airport. Aside from the multitude of options offered by the attractions of the Las Vegas entertainment industry, the region is home to many other great cultural venues. Places like the Nevada State Museum, The Las Vegas Natural History Museum and the Ethel-M Chocolate Factory, and Cactus Garden Tour are just a sample of some exciting nearby destinations. The University of Nevada Las Vegas offers many performing arts and theatrical shows. For outdoor enthusiasts, Red Rock Canyon Conservation Area is only a few minutes from Sun City Summerlin and Valley of Fire State Park, which is Nevada's first state park, is 50 miles north. Lake Mead is only an hour to the east and offers great boating, fishing, skiing and swimming. Sun City Summerlin, with its convenient location, low-maintenance homes, and bountiful amenities, is one of the premier active adult communities in Nevada. Mountain Shadows Clubhouse hosts most of the community's outdoor amenities including the 18-Hole Palm Valley Golf Course. 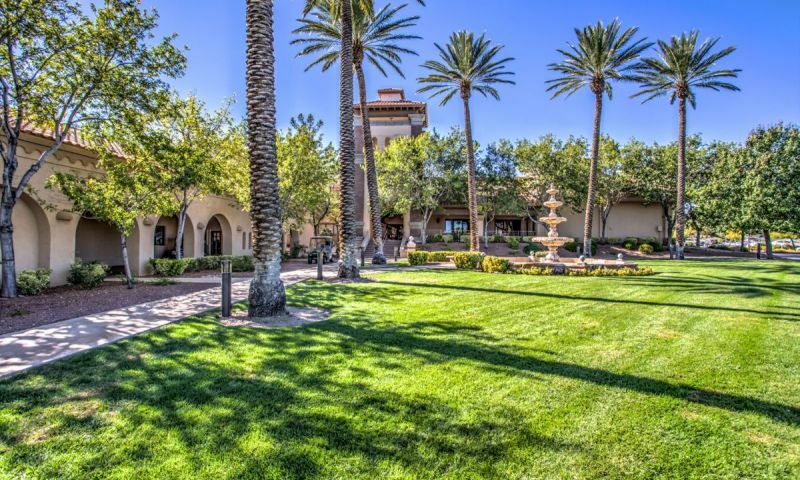 The 44,000 square-foot Desert Vista Clubhouse is the community's location for staying physically active whether its breaking a sweat in the fitness center or meeting with neighbors for a bocce ball game. Desert Vista Community Center - 44,000 Sq. Ft. The Sun Shadows Clubhouse is a smaller community center that features indoor and outdoor amenities for residents who live nearby. The main feature of Sun Shadows is the immaculately constructed Olympic-sized indoor pool. Pinnacle Clubhouse acts as the community's cultural center with the 312-seat Starbright Theater and a music room. The clubhouse also hosts the 18-hole Eagle Crest Golf Course and The Summit restaurant. The Highland Falls Golf Course is an 18-hole course designed by renowned architects Billy Casper and Greg Nash and also features a full-service restaurant. There are plenty of activities available in Sun City Summerlin. Here is a sample of some of the clubs, activities and classes offered here. There are eighteen attached home options in Sun City Summerlin. Constructed between 1989 to 1999, these attached homes feature one to two bedrooms, one to two-and-a-half bathrooms, and an attached one to two-and-a-half car garage. The single family homes in Sun City Summerlin were constructed from 1989 to 1999. These homes range from 1,086 to 2,895 square feet and feature one to three bedrooms, two to two-and-a-half bathrooms, and an attached two to two-and-a-half-car garage. I feel so fortunate that I decided to buy in Sun City Summerlin. I visited numerous ageresticted communities throughout the country and Sun City Summerlin stood head and shoulders above the rest. Our community is stunningly beautiful, immaculate and active. Before we moved here last year from WA state, I was a tired 72 year old retiree. We bought thinking we could sedately retreat into retirement. How WRONG we were. Instead of being sedate, our schedule is fuller now than at any time in the past 20 years. Yesterday we were on the LV strip at Planet Hollywood watching Murray the Magician (plus having dinner after the show). Today my wife is going to one of her classes and I am going to a committee meeting. Tomorrow we will be attending the weekly 60s and 70s Rock and Roll dance at the community restaurant. The day after, we will be at the annual Home and Garden show at the community activity center. Sunday, it will be a day of rest. And then on Monday, unfortunately I have a doctor's appointment. But on Tuesday I have a community health seminar on diabetes and on Wednesday afternoon, I have a regularly scheduled card game. I am still tired, but it's not from feeling sorry for myself; it's from being the most active I have ever been in my life...and I love it. We've lived here about 15 years. One might think after all this time I might have found something significant to complain about but the truth is...I haven't. Living in Sun City is a permanent vacation. I might miss the beach but, on the other hand, we have indoor and outdoor pools so I have access to water 12 months a year. The homes and grounds are very well maintained. The HOA fees are more than reasonable for the services and upkeep provided. When we left the east coast many people asked if we knew anyone here. I said yes, I have a lot of friends in Sun City; I'm just waiting to meet them! (My attitude has served me well.) If you're interested in a beautiful retirement community with many activities and clubs this may well be an environment you wish to consider. We purchased a home in Sun City Summerlin in March and have not yet spent much time there but after researching several 55+ communities, we knew on our initial drive through the beautiful community that it was where we wanted to buy a second home. The community offers a very impressive amount of both indoor and outdoor activities. The Association is very well organized and very responsive to newcomers. Close proximity to shopping, restaurants, medical facilities, etc. was also a huge factor in our decision to purchase a home in Sun City Summerlin. We are looking forward to becoming a part of the community and enjoying all that Sun City Summerlin has to offer. We've lived here for almost 5 years and love it! We are very active in the community and enjoy making the most of every day. It's been great having the time and the facilities available to try lots of new things. The golf here is fabulous as are the restaurants. When we purchased a home here there were plenty of resale options to choose from. It was kind of a hard choice to pick the perfect one! Really, it's more about the amenities and the lifestyle here rather than our home. Our review must be short for we are new residents and are looking forward to meeting new people and sharing in the communities events. Our conception of Sun City Summerlin has been positive. 55places.com is not affiliated with the developer(s) or homeowners association of Sun City Summerlin. The information you submit is distributed to a 55places.com Partner Agent, who is a licensed real estate agent. The information regarding Sun City Summerlin has not been verified or approved by the developer or homeowners association. Please verify all information prior to purchasing. 55places.com is not responsible for any errors regarding the information displayed on this website.